Some new examples for you to look at. The watermelon tourmaline is a rare variety of tourmaline that displays three different colours in the same crystal - green (the skin of the watermelon), pink (the sweet fruit) and white (the rind).The colours of the watermelon tourmaline occur 100% naturally. This is a rare occurrence in nature. In this particular example the centre is very dark, almost black. 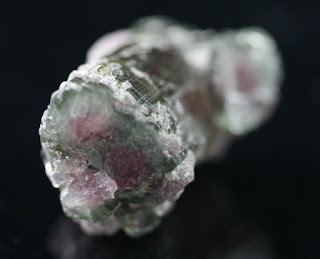 It is also suggested that Watermelon Tourmaline can attract love, Balance the male and female energies within yourself, Remove imbalances (and guilt) caused by conflicts and confusions. The green part feeds your life force, while the pink soothes and harmonizes. There are seven varieties of tourmaline that occur in various colours; pink, red or rubellite, green tourmaline, blue or indicolite, black or schorl, Watermelon and tourmalated quartz. Watermelon Tourmaline has a calming, stress relieving quality it helps us to see the funny side of things. Watermelon Tourmaline helps us with patience, tenderness, tact and diplomacy. It helps us to resolve conflict and to alleviate old pain and anguish. It is also excellent for relieving depression and fear and replacing them with a sense of inner security. Watermelon Tourmaline helps hyperactive children to unwind. It also helps to calm adults who regularly have hysterics or who have to make a drama out of everything. Watermelon Tourmaline brings us joy in the simple act of living and with this joy comes an overall sense of harmony. Watermelon Tourmaline is an excellent crystal for the heart chakra. It connects the heart chakra to our higher self and in doing so creates an energetic field of, love, understanding, compassion and friendship. Watermelon Tourmaline also helps us to appreciate nature.